I recently decided that if I'm going to write book reviews on here, I should actually try to take notes or at least highlight passages in books so that I can look back at them and remember what I wanted to talk about... so of course, the first book that I choose to do that with to be one where to talk about the main topic of the book would immediately involve diving into spoiler territory. I won't, but I would love to talk about the book to somebody who has actually read it! 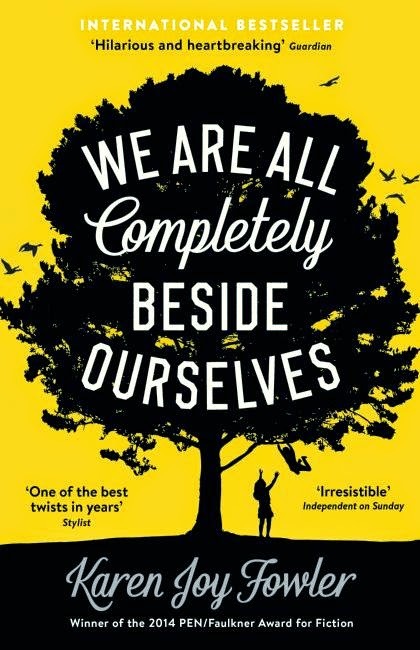 If you have heard anything (other than the booker nomination) about We Are All Completely Beside Ourselves, then you probably know that there is a massive twist in the story about 70 pages in. I already had the book, which I had bought without knowing much about (other than that it was cheap and nominated for the booker), and was convinced to read it when I heard Simon on The Readers podcast* talk about how amazing the twist is. I hate being spoiled, so I knew that I needed to read it before I heard anything else about the book. But setting the twist aside for the moment, as soon as I got a few pages into the book I knew I was going to love it. The book does a really good job of setting up this family where something is not quite right, but nobody is willing to talk about it for fear of upsetting the status quo, in an early part of the book where Rosemary goes home from college for thanksgiving. There are also several places where it is hinted that the narrator, Rosemary, is not entirely normal, exemplified by a scene in the college cafeteria, where she gets embroiled in an argument between a couple, where she ends up acting not entirely like a normal person would. This all made me really want to read on and figure out what was actually going on. Another thing that I really liked is that Rosemary is a really self-conscious narrator. By that I mean that she is extremely aware that she is telling a story, and often makes asides to the reader, saying things like "Such a sweetheart. But don’t get attached to him; he’s not really part of this story". I think this could have been done really really badly, but it is handled really well, and makes Rosemary much more likeable, even when her behaviour is initially inexplicable. The story starts in the middle, and then moves all over the place before finally reaching the end, but this is done in a way that feels natural and not at all jarring. This is a technique that I really love when it's done well. So now we come to the twist... and what a twist it is! I honestly did not see it coming in any way. It wasn't even in the genre of twist that I thought it would be. It turns what I thought was another well-written story about a dysfunctional family into something quite different. To be honest, it completely flummoxed me until I had read on a few pages when it all started to make sense. I think the thing that I like the most about the twist is that it isn't the whole book. I think you could quite happily know what the twist is before reading it and it wouldn't ruin your enjoyment of the book at all. I don't mean to say that because the writing is excellent (though it is), or that the characters are well rounded and interesting (though they are), you are going to enjoy the rest of the book even if you know what happens. What I mean is that the twist reveals the main point of the book, the fact that there is a twist isn't the point. I would still recommend not knowing what the twist it is before you read it though. I would be very happy if this wins the booker, and the fact that I enjoyed this so much is making me wonder if I should try to read the rest of the shortlist (I went off the booker prize a few years ago when I tried to read The Finkler Question which I HATED and did not finish, which is pretty rare for me)... I probably won't though, haha. "When there is an invisible elephant in the room, one is from time to time bound to trip over a trunk." "“Pass the turkey, Mother,” my uncle Bob said, sliding smoothly into his traditional rant about the way turkeys are being bred for more white meat and less dark. “The poor birds can hardly walk. Miserable freaks.” This, too, was intended as a dig at my father, the enterprise being another of science’s excesses, like cloning or whisking up a bunch of genes to make your own animal. Antagonism in my family comes wrapped in layers of code, sideways feints, full deniability." "Language does this to our memories—simplifies, solidifies, codifies, mummifies. An oft-told story is like a photograph in a family album; eventually, it replaces the moment it was meant to capture." "At dinner, I adopted my usual strategy of saying nothing. The spoken word converts individual knowledge into mutual knowledge, and there is no way back once you’ve gone over that cliff. Saying nothing was more amendable, and over time I’d come to see that it was usually your best course of action. I’d come to silence hard, but at fifteen I was a true believer." * If you like book podcasts and haven't tried that one, you should! I only recently discovered it and have really enjoyed the back episodes that I've listened to so far. Do you think that counts as a twist/spoiler? Because I was fully intending to mention it before I wrote my review, but I won't if it's not common knowledge. I knew what was going on before I picked the book up somehow, but I actually thought it was part of the blurb! I don't think I liked this nearly as much as you did - but I forgot about it so quickly that I can't really remember why. I think it was the lack of conclusion? The blurb on my copy definitely doesn't mention it, and the cover says "one of the best twists in years!" or something, and if you're not expecting it it is definitely a surprise! On the other hand, it is kind of difficult to talk about the book without mentioning that part (as demonstrated above! ), and some of the other covers that I've seen for the book completely give it away.. plus, I don't think knowing it would really lessen the book particularly. So it could be either really. I haven't heard anybody mention what the twist is, so issuing a spoiler warning might be the way to go? I like self-conscious narrators when they are done well, but I've seen some really bad examples of it before, hehe. This is the first time in a while that I've thought it was handled perfectly. Hehe, I quite often forget why exactly I liked or didn't like books. Quite often I'm left with just a goodreads star rating and then I end up trying to work out why exactly I though that a book was worth however many stars I gave it. I can see that the ending could be a bit annoying, but I personally think it worked for the book. I'm looking forward to seeing your review, I haven't really read anybody else's thoughts on it! I think I might have to employ that tactic - I've just looked at my review notebook and my review is up next-but-two so I'll have to think about it. All my notes make reference to the twist itself though - if I don't mention it, it will be a very short review, haha! Well, I do keep notes but in this case it hasn't helped much. I think this book just felt a little... flat perhaps? It wasn't about what I expected it to be. I understand that isn't necessarily the book's fault, but the blurb implied that it was an adult's take on her childhood being an experiment, but that was barely touched upon. It was too animal-rights-centered, and I occasionally felt like I was being preached at. Fair enough! I really try not to read the blurb before I read books (and to leave some time between learning enough about them to want to buy them and actually reading the book) because I've been burned by blurbs either giving me false expectations of the book or ruining something in the book a few too many times. I can imagine that this would not work if you have a TBR list as big as yours though! I felt like I was being preached at a bit too, but for some reason it didn't bother me. Maybe because animal rights aren't a huge issue in Japan (not many people care, and I think animals are treated better here in general than they are in many other countries - I have absolutely no evidence to back this up though! ), so I don't get that much exposure to the issues anymore. Possibly. Maybe I was just in the mood to be preached at? Hehe.